Jatiya Party(jp) ChairmanHM Ershad has threatened that he would shoot himself to death if any attempt is made to arrest him. The former dictator made the statement before journalists hours after law enforcers cordoned off his house at Baridhara diplomatic zone in the capital in the wake of his announcement to stay away from the next parliamentary election. Ershad went down to the ground floor of ‘President Park’, his house, at 11:10pm to talk with journalists who had been crowding there since yesterday afternoon to cover if Ershad was arrested. If the law enforcers tried to arrest him, he would kill himself with the four bullets loaded in his pistol, Bangla daily Prothom Alo quoted Ershad to be saying. Saying that he was not fearing arrest though many were doing so, the JP chief said the country would be on fire if he was arrested, the Prothom Alo report added. He said there was no-one beside him when he took the decision to boycott the upcoming parliamentary polls. He took the right decision and would stick to that, Ershad insisted, the Prothom Alo report reads. The JP chief also said his partymen were ready to take to the streets. 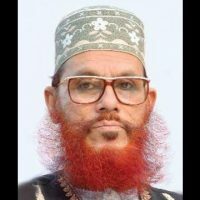 After the deployment of a large number of police and Rab at Ershad’s house yesterday afternoon, a rumour spread fast that the former military strongman might be arrested. A mid-ranking officer of a Rapid Action Battalion-1 team that entered the former dictator’s house told The Daily Star that they went there to arrest the JP chief. The law enforcers swung into action shortly after visiting Indian Foreign Secretary Sujatha Singh had a meeting with the JP chief at his house. 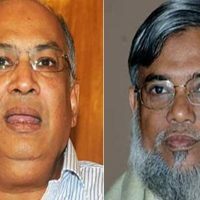 The developments followed a series of events centring the participation of the former constituent of the Awami League-led Grand Alliance in the next parliamentary election. Though JP pulled out of the Grand Alliance, 261 JP candidates Monday submitted nomination papers to participate in the election. 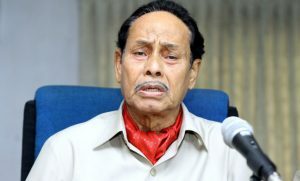 The next day, Ershad announced that his party would not participate in the election. 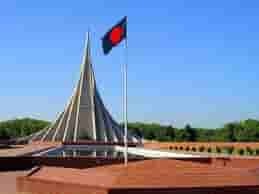 In the morning, the former dictator issued a press note directing all JP aspirant lawmakers to withdraw nomination papers, Sunil Shuvra Roy, press secretary to Ershad, told The Daily Star. Few hours later, he instructed four ministers, two state ministers and an adviser to the prime minister to resign from their positions immediately. Law enforcers took position in front of his house at Baridhara diplomatic area in the afternoon when the former dictator was having a meeting with an Indian delegation led by foreign secretary Singh. Shortly after the Indian delegation left the area, a team of Rab-1 team led by the unit’s commanding officer entered Ershad’s house. They did not let anyone enter the house at first. A few hours later, the security was relaxed a bit.